It’s not just a theory that stress causes magnesium deficiency and a lack of magnesium magnifies stress. In the October 2011 issue of The Journal of Neuroscience, top neuroscientists at Tsinghua University in Beijing, University of Texas, and University of Toronto revealed that by increasing the extracellular magnesium concentration in the brain … the cognitive ability – an essential facility that controls fear and anxiety – is enhanced. Giving the stress hormone, adrenaline, intravenously causes a decrease in magnesium as well as calcium, potassium, and sodium. Without enough magnesium to relax arteries and muscles, blood pressure rises and the heart muscle cramps. When intravenous adrenaline is stopped, the body recovers in about thirty minutes and potassium rises. However, it takes much longer for magnesium to reach normal levels. There are over a dozen major metabolic processes that are affected by adrenaline, including heart rate, blood pressure, blood vessel constriction, and muscular contraction. Each of these functions requires magnesium and leads to a depletion of this important mineral as the body’s response to stress continues. Without sufficient magnesium, the nerve cells cannot give or receive messages.They become excitable and reactive causing a person to become stressed, highly sensitive and nervous. In addition to the adrenal response, the stress response involves the influx of calcium into cells, resulting in a drastic change in the cell’s internal magnesium-to-calcium ratio. Normal cells contain 10,000 times more magnesium than calcium. If the amount of cellular magnesium falls however, calcium flows into the cell. With such an imbalance, calcium triggers the cell into a hyperactive state. This can cause widespread muscle cell contraction and lead to painful cramping. Muscles need magnesium in order to relax. Magnesium supports our adrenals and our immune system which stress, poor diet and lack of sleep overwork. Magnesium deficiency, which is common in over 75% of Americans is significant because over 325 enzyme systems in the body require magnesium. The most important ones are responsible for energy production and storage. A strain on the adrenal glands puts a strain on the magnesium-dependent energy system of the body which further promotes stress. The person with a low magnesium level during stress will experience energy depletion which can lead to anxiety and depression, impulsive consumption of junk foods and caffeine and a decreased ability to manage stress. Additionally, due to modern farming methods and food processing procedures – magnesium is largely depleted from our soils and foods making magnesium supplementation an absolutenecessity. “I do believe that much of the food available to us is nutrient-poor, and that most Americans eat a largely unhealthful diet and need to get back to eating real food,” says Elisa Zied, R.D. Our grocery stores are full of food bulked up with added sugar, refined carbohydrates and vegetable fats, like corn oil. These foods are missing vital nutrients, such as magnesium and vitamin B12, and essential fats, such as conjugated linoleic acid. In summary, feelings of nervousness, irritability and being unable to relax may be signs of magnesium lack. Magnesium is the most important anti-stress mineral and is also known to alleviate depression, anxiety and insomnia. This mineral is something we all need in these tough and stressful economic times. One of the most absorbable forms of nutritional magnesium is magnesium citrate powder which can be taken with hot or cold water and can be found in most health food or vitamin stores. Carolyn Dean, MD, ND is a health pioneer with over 30 years of experience inspiring and motivating people to be their healthy best. She’s authored 27 books including “Future Health Now Encyclopedia”, “The Complete Natural Guide to Women’s Health, “Hormone Balance”, “365 Ways to Boost Your Brain Power: Tips, Exercise, Advice”, “The Yeast Connection and Women’s Health”, “IBS for Dummies” and, her most popular book, “The Magnesium Miracle”. 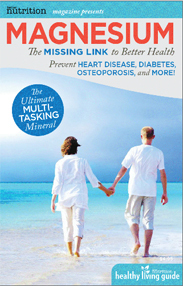 She is the medical director for the non-profit Nutritional Magnesium Association.